Video is the most effective and persuasive type of evidence. Don't let blotchy, grainy video detract from your presentation! 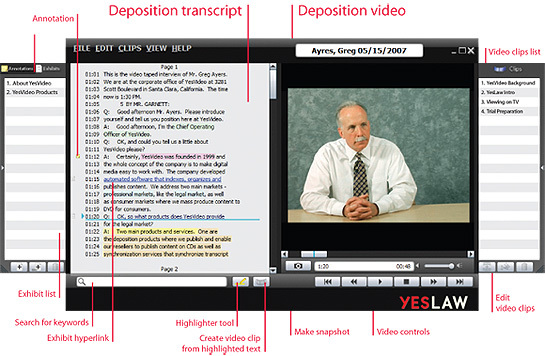 With YesLaw DVD, video is captured in high-quality MPEG-2 format. This retains video quality when blown up to a large screen size, allowing you to present the deposition evidence without distracting artifacts. Each YesLaw DVD contains up to 2 hours of video. When viewed on a DVD player, the DVD is chaptered by transcript page number so you can find video fast. Simply select the transcript page number with your DVD remote control and view the video. The transcript text is optionally shown as subtitles, easily accessed using your remote control. 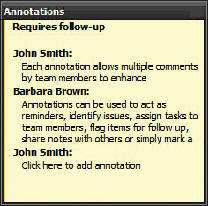 Add annotations to identify issues, assign tasks to team members, flag items for follow up, share notes with others or simply mark a line to find it quickly later. Highlight to mark transcript passages that require further attention. Color code to identify issues, priorities, team-member assignments, or the highlighter?s identity. Hyperlink exhibits to transcript text to recall with a click. The exhibit files can be conveniently located on the disc or on a shared network resource. Email your annotations, highlights, linked exhibits, and video clips to others or save your work to a shared server. Focus on the evidence, not the technology. 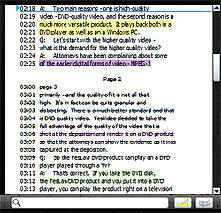 Create video clips by simply highlighting transcript text. The YesLaw software includes a full-screen courtroom playback interface to present your video clips. The transcript is optionally shown below the video.